The FEAC Institute has been training and certifying Enterprise Architects since 2002 (read more). If you want to be the best... learn from the best! Take your career to the next level with the coveted ACEA (Assocaite Certified Enterprise Architect) Green Belt certification in Enterprise Architecture. Whether you are brand new to EA, a Business Analyst needing a deeper understand of your Enterprise or a seasoned IT professional needing a refresher, our courses will broaden your understanding of Enterprise Architecture and modeling. Designed to be practical and immediately applicable for working EAs, Business Analysts and IT Professionals, the FEAC Institute's world-renown certification programs are the longest running EA programs in the country. Only FEAC offers the CEA designation! Live or totally online, we don't just prepare you to take a test. This is real, University-backed Enterprise Architecture and competency-based learning. You'll do a real practicum project and solve real problems in class. What sets our program apart from all others is the demonstration of competency. Because our CEA program takes place over 3 months, we take the time with you to develop your EA skill and ensure that your are competent to do Enterprise Architecture. We don't just show you what models look like, you will gain experience creating them yourself inside a real life project. This course is not just an exercise in test preparation. In addition to world-class instruction, we will guide you through a real-life practicum project. You pick the project, the you and your team will develop the models and architecture to create the Architecture and solve real business problems in class. Finally, all of our curriculum is accredited by the California State University, so you can be sure that the rigor of the program, the curriculum and excellence are at the University level. Any education or certification in Enterprise Architecture needs to be grounded in both frameworks (i.e. Ontologies) and methodologies. We offer education in Enterprise Architecture that gives students broad exposure to the Enterprise Ontology and a range of framework and methodology choices with specialization in the Department of Defense Architecture Framework (DODAF) and the Federal Enterprise Architecture Framework (FEAF). Each of these Enterprise Architecture Frameworks have proven to have immediate applicability and impact in the private sector as well as the Federal space. FEAF and DoDAF are very powerful Frameworks and you don't have to be in Government to derive immediate EA impact from either of them! Now learn both Frameworks for the price of one! You will learn both FEAF and DoDAF as part of your Green Belt certification! Newly re-designed, our Black Belt Program now equips you to learn both Frameworks, with much more depth in analytics and problem solving using various tools from around the industry! 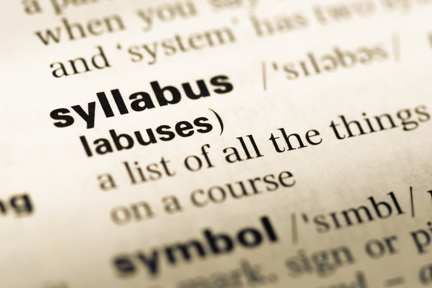 Check out descriptions and syllabi for both Frameworks below! Click here to register for the Green Belt Spring 2019 - Space is limited! 1st Early Bird! Register by January 27 and save 15%! 3rd Early Bird! Register by March 29 and save 5%! Self-Study opens April 22; however course registration is available up to one week prior to the 1st Instructor-Lead session. Registration cut-off for Spring 2019 is April 29, 2019. Session 1 Self-study: April 22-May 6, 2019: online in the FEAC Virtual University (course registration still available during this time). Course materials and assignments are reviewed and performed by the student on-line in the FEAC Virtual University in preparation for Instructor-lead session. Session 1 Instructor-lead Session: May 7-9, 2019: virtually or in-seat at the UVA/VT Northern VA Center in Falls Church (Student choice). 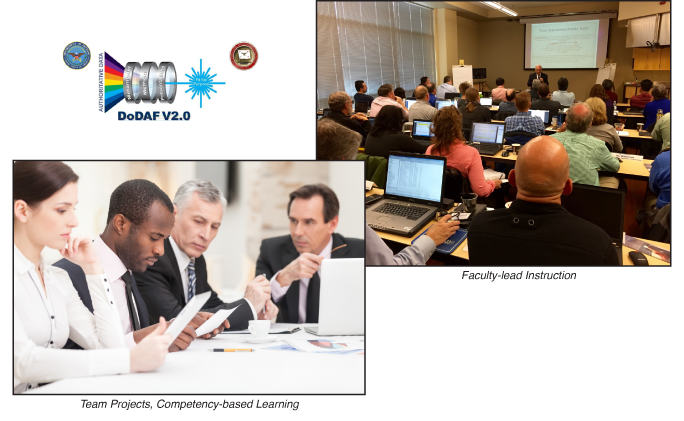 Three days (24 contact hours) of instructor-lead, hand's-on, facilitated sessions with exercises and demonstration, building skills and competency in the building of Enterprise Architecture artifacts, models and analysis. Students may attend either the physical, classroom environment or via tele-presence (online). 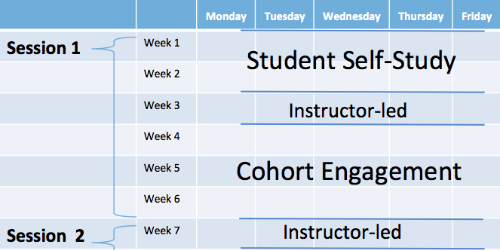 Session 1 Cohort Engagement: May 10-June 3, 2019: online in the FEAC Virtual University. Team-based completion of assignments and practicum, accessing material and assignments online in the FEAC Virtual University. Students should plan to allocate 40-60 hours for assignments and practicum. Session 2 Instructor-lead Session: June 4, 2019: virtually or in-seat at the UVA/VT Northern VA Center in Falls Church (Student Choice). Student cohorts will present their practicum results and participate with industry speakers. ACEA candidates (Green Belt) present their practicum and will test online for completion of the certification. Note: the actual duration of session 1 and session 2 Cohort Engagements may vary depending on U.S. Federal Holiday and Faculty Availability. They may be longer or shorter by one week. You will be given access to the FEAC Virtual University on April 22. There is required self-study and lecture to prepare you for class on May 7. We look forward to seeing you on May 7 at the UVA location (details below) or online, virtually on May 7 as well if you choose this option. Need to split up your payment for fiscal year considerations? No problem! Just contact us to make arrangements. You don't have to be in Government or in Defense to derive the awesome benefits of this powerful, Enterprise Architecture Framework! The Department of Defense Architecture Framework (DoDAF), Version 2.0 is the overarching, comprehensive framework and conceptual model enabling the development of architectures to facilitate the ability of managers at all levels to make key decisions more effectively through organized information sharing across the Organization, Joint Capability Areas (JCAs), Mission, Component, and Program boundaries. The DoDAF serves as one of the principal pillars supporting the DoD Chief Information Officer (CIO) in his responsibilities for development and maintenance of architectures required under the Clinger-Cohen Act. DoDAF is prescribed for the use and development of Architectural Descriptions and it also provides extensive guidance on the development of architectures supporting the adoption and execution of Net-centric services within the organization. DoDAF V2.0 focuses on architectural "data", rather than on developing individual "products" as described in previous versions. In general, data can be collected, organized, and stored by a wide range of architecture tools developed by commercial sources. DoDAF V2.0 provides a Data Capture Method for each data group of the DM2 to guide architects in collecting and organizing the necessary architectural data. The DoDAF enables architectural content that is "Fit-for-Purpose" as an architectural description consistent with specific project or mission objectives. Because the techniques of architectural description can be applied at myriad levels of an enterprise, the purpose or use of an architectural description at each level will be different in content, structure, and level of detail. Tailoring the architectural description development to address specific, well-articulated, and understood purposes, will help ensure the necessary data is collected at the appropriate level of detail to support specific decisions or objectives. Visualizing architectural data is accomplished through models (e.g., the products described in previous versions of DoDAF). Models can be documents, spreadsheets, dashboards, or other graphical representations and serve as a template for organizing and displaying data in a more easily understood format. When data is collected and presented as a "filled-in" model, the result is called a view. Organized collections of views (often representing processes, systems, services, standards, etc.) are referred to as viewpoints, and with appropriate definitions are collectively called the Architectural Description. DoDAF V2.0 also provides, but does not require, a methodology in architecture development call the 6-Step Architecture Development Process. It provides guidance and suggestions on how to ensure that other proposed methods can be adapted as needed to meet the requirements for data collection and storage. Similarly, the views presented in DoDAF are examples, intended to serve as a possible visualization of a particular view. DoDAF V2.0 also continues providing support for views (i.e., 'products' developed in previous versions of the Framework). These views do not require any particular graphical design by toolset vendors. The Federal Enterprise Architecture Framework v2 describes a suite of tools to help planners implement the Common Approach to Enterprise Architecture. This promotes increased levels of mission effectiveness by standardizing the development and use of architectures within and between organizaitons, and includes principles for using EA to help organizations eliminate waste and duplication, increase shared services, close performance gaps, and promote engagement. 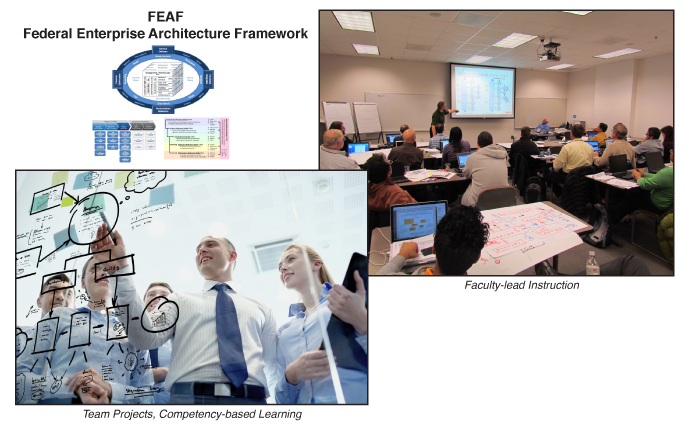 Ultimately, the FEAF develops Enterprise Architecture (EA) to support planning and decision-making through documentation and information that provides an abstracted view of an enterprise at various levels of scope and detail. These are designed to facilitate analysis and the identification of duplicative investments, gaps and opportunities for collaboration within and across the enterprise. Also, by applying all six reference models, organizations can establish a line of sight from the strategic goals at the highest organizational level to the software and hardware infrastructure that enable achievement of those goals. Collectively, the reference models comprise a framework for describing important elements of operations in a common and consistent way. To apply the framework to an organization's specific environment, the organization should develop a set of “core” artifacts to document its environment within the framework presented by the CRM. Each sub-architecture domain represents a specific area of the overall framework and has particular artifacts, based on EA best practices, which are described and recommended in the Framework and Artifacts document. The type and depth of documentation actually used by the organization should be guided by the need for detail and answers to questions about requirements, applicable standards, timeframes, and available resources. The real value to the organization of developing an Enterprise Architecture is to facilitate planning for the future in a way that transforms the enterprise while making it more efficient. The organization can use the EA process to describe the enterprise as it currently is and determine what the enterprise should look like in the future, so that it can make plans to transition from the current state to the future state. The Collaborative Planning Methodology provides steps for planners to use throughout the planning process to flesh out a transition strategy that will enable the future state to become reality. It is a simple, repeatable process that consists of integrated, multi-disciplinary analysis that involves sponsors, stakeholders, planners, and implementers. The organization will create an Enterprise Roadmap to document the current and future architecture states at a high level and presents the transition plan for how the organization will move from the present to the future in an efficient, effective manner. The organization's Enterprise Roadmap combines the artifacts developed for the EA, both current and future state versions, with a plan developed through the Collaborative Planning Methodology. This creates awareness, visibility and transparency within an organization to facilitate cross-organization planning and collaboration. It maps strategy to projects and budget and helps identify gaps between investment and execution, as well as dependencies and risks between projects. All in all, the Federal Enterprise Architecture Framework v2 helps to accelerate business transformation and new technology enablement by providing standardization, analysis and reporting tools, an enterprise roadmap, and a repeatable architecture project method that is more agile and useful and will produce more authoritative information for intra- and inter-organization planning, decision-making, and management. We offer early bird discounts. See our Training Dates page for specific early bird pricing. After March 8, Government Employees are eligible to receive a $500 discount for a total of $5,500 US on the FEAF ACEA Green Belt Course. You must have a valid Government email address. These courses are available as both in-seat, on location and now as a virtual, online session (more info)! (You have to be on-line at the same time as the other students are in class- but you can be in your pajamas!) Please select how you would like to take the course at registration. There are no prerequisites for any of the sessions. Some browse our resources and blog sections. We start every day at 8:00 AM and will finish at about 4:30 PM Eastern Time. All class materials will be available to you for download from our Virtual University. You will receive access to that shortly. There is a wireless internet connection available but we ask you to refrain from surfing during class lectures. The room number will be posted at the entrances of the Building. For lunch, restaurants are within walking distance and guidance will be provided. There is a nice Indian restaurant, a Starbucks, Baja Fresh and Subway across the street. There is also an eating area on the first floor by the elevators. There is a microwave there and vending machines that include coffee, cold drinks, sandwiches and snacks. Room number will be posted at the entrances of the Building. There are several hotels close by. One thing to keep in mind if you are NOT driving or renting a car. The Falls Church Metro Station (ORANGE LINE) is about 100 yards from the UVA Northern Campus. So as long as the hotel you pick is close to an ORANGE LINE Metro Station, you can take the Metro each day to Falls Church, walk 100 yards uphill and to the right to the clearly visible UVA building. If you are driving, there is plenty parking at UVA available for you at a cost of $4.50 all day. To get there make a left left from Haycock Road at the traffic light (coming from Route 7). At the stop sign (30 yards) do not turn right or you end up at the Metro Station but continue straight as if you are going to the new Metro garage down on the right. Actually you can see the Parking lot you are going to on the left at the stop sign but there is a chain across the entrance. You can not enter there. About 100 yards after the stop sign you need to turn left into the UVA/VT parking lot (NOT THE METRO GARAGE BUILDING ON THE RIGHT) and drive all the way up to the UVA Brick Building. CEA BLACK BELT Completion: If you are a current ACEA who previously took our Green Belt program, and would like to complete your CEA Black Belt, you are eligible for 50% off the CEA course. Register for the CEA Black Belt course and use Discount Code: BBCOMPLETE upon checkout. Any student interested in staying in the current session, but upgrading their registration to the next level (i.e. : upgrade from 3-Day to 5-Day, or from 5-Day to ACEA, or ACEA to CEA, etc), please contact us, or tell one of our faculty on site that you would like to upgrade. We will upgrade you and bill you the difference. All discounts may not be combined with any other discounts or offers. Purchase Orders or Government form SF-182: Use "Pay Later" option upon checkout and select "Purchase Order," or "Invoice Me." Need to split up your payment for fiscal year considerations? No problem! Just contact us to make arrangements (payments must be made by your organization). We start every day at 8:00 AM and will finish at about 4:30 PM. All class materials will be available for download from our Virtual University. Each student will receive access roughly 1 week prior to course start. Lunch: restaurants are within walking distance and guidance will be provided. There are several choices directly across the street (i.e. : Indian, Starbucks, Baja Fresh, Subway etc.) There is also an eating area on the first floor by the elevators. There is a microwave there and vending machines that include coffee, cold drinks, sandwiches and snacks. All confirmed registrations must be paid in advance. Special arrangements can be made for select government agencies. Please contact us for these special arrangements. All early bird registrations must be paid by the cut off date, or else invoice will be adjusted to regular price. You can register for any course or seminar by clicking the "register" button or "view all events" button. All payments made on-line are to be made in USD. Registrations are transferable within your organization (to a colleague) on request until 2 days before the event date. Confirmation of registrations will be subject to availability and timely receipt of payment. Prices stated here include tax. Import duties and/or local taxes/GST/VAT, if applicable, are NOT INCLUDED in prices and must be borne by the registrant. Registrations may also be transferred to a future course date if student are unable to attend. Seating will be on a first-come, first-served basis. For cancellation, please refer to the "Cancellation Policy" section below. 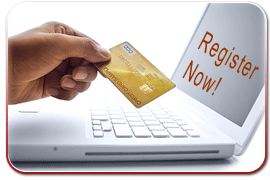 Registration allows us to use the name of your organization in our future marketing activities as our customer. 25 days prior to the scheduled date: 10% of total the registration fee will be levied to cover administration costs. In addition, a refund charge of $25 USD is also applicable. 15 days prior to the scheduled date: 20% of total the registration fee will be levied to cover administration costs. In addition, a refund charge of $25 USD is also applicable. 5 days prior to the scheduled date: no refund of monies paid. Registrations are transferrable within your organization (to a colleague) on request until 2 days before the event date. Note: the above cancellation policy is applicable for confirmed but unpaid registrations as well. There will be NO exceptions to this policy for any reason. The FEAC Institute reserves the right to postpone or cancel an event, to change the location of an event. In the event that the FEAC Institute postpones a conference, delegate payments at the postponement date will be credited towards the rescheduled date. If the delegate is unable to attend the rescheduled event, the delegate will receive 100% credit representing payments made towards a future FEAC Institute events or you may send a replacement. No refunds will be available for cancellations or postponements. The FEAC Institute is not responsible for any loss or damage as a result of substitution, alteration, postponement, or cancellation of an event due to causes beyond its control including without limitation, acts of God, natural disasters, sabotage, accident, trade or industrial disputes, terrorism or hostilities.